If you can not decide what you want to visit this weekends – cinema, theatre or just have fun with friends in a fashion bar – Berlin gives you a chance to be in all these places in the same time. Welcome to ACUD Kunsthaus! 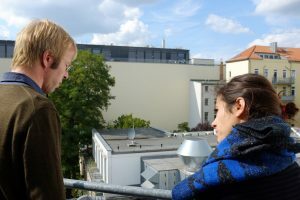 This culture center started working in 1991 and now ACUD is one of the most popular and interesting art spaces in Berlin. If you want to express yourself like an artist or a singer, there are a lot of opportunities in ACUD to make an exhibition, photogallery, perfomance in concert halls of art space and just create your own art atmosphere! Owners of this center, a group of talanted and inspires people, are always happy to help your dreams come true. And when you are in ACUD space, you feel it! You feel a real art life!